It’s Halloween!! I don’t believe in ghosts, sorry, not in any way, shape, or form, I just don’t, but I do seriously love ghost stories. Go figure that, I know I can’t. As long as I can remember, I have loved ghost stories, reading them, hearing them, telling them, making them up. Much of what I write seems to involve ghosts in some way or another. I invest in the stories I read/hear/write wholeheartedly but, as soon as anyone tries to ‘get scientific’ and convince me that ghosts are real I simply switch off. When I was little, there was a ghost story book in my grandparents house, I remember it vividly even though I must have been only nine or so. 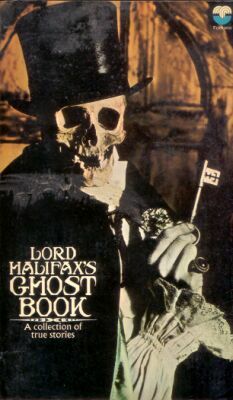 It was called ‘Lord Halifax’s Ghost Book’ and it was a collection of alleged-true reports of ghostly happenings. The text was probably unsuited to a young lad like myself, there was lots of that old-fashioned practice of substituting real names for ‘M_’ or ‘N_’ – That ‘Edgar Allen Poe’ thing which I always find off putting. The cover of the book was great, though. (I found a picture of it and stuck it on top). As you can see, it was a skeleton, in a top hat and cape, grinning, and he was holding that big old key. Creepy, isn’t it? I loved that cover and, even though I was only wee, I struggled through all the stories inside, perhaps solely on account of the spooky loveliness of that cover. Anyway, I reckon that book may have been the genesis of my love for ghost stories. But how can I possibly enjoy stories about ghosts if I don’t believe in them at all? It is a bit of a mystery all right. I think the ‘ghost story’ is a fascinating device with which to tell life-affirming stories. I think it allows the narrative to traverse the boundaries of death itself and it allows an exploration of ‘fear’ and ‘need’ as no other subject can. Like most people, I have a sort of ghost story of my own too. I don’t believe it, of course, but I’ll tell you anyway. My local theatre is The Linenhall, I write about it here quite often. Everyone who works there is my friend and I have had great experiences there, both with my own plays and with everyone else’s too. One great memory I have of The Linenhall is when I was allowed to sit and watch the Welsh Ballet Company rehearsing for – I think it was Romeo and Juliet – I was the only one in the theatre apart from the dancers and they were all in full classical ballet dress. But they weren’t dancing to Romeo and Juliet, no, they were dancing to ‘I’m Like a Bird’ by Nelly Furtado. It was a truly remarkable sight and it felt like it was mine, all mine. Since then, I am always on the lookout for remarkable little moments in The Linenhall. One morning, I was in the deserted theatre, as I often am, and I was walking up the side corridor that leads into the theatre when I heard a piano playing from inside the auditorium. I put my ear to the door and could hear the piano crystal-clearly through it. It was some classical melody which I couldn’t identify. I thought this might be another golden opportunity to sneak in and see a performance being rehearsed but I also knew that if I walked through the door I was at, I would arrive right in the middle of the performance area. So, instead, I high-tailed it back down the corridor, up the main stairs and in through the rear auditorium entrance. I crept in so as not to disturb the piano player. But the theatre was pitch dark…. there was no piano player… there was no piano. I quickly checked the control room. Somebody must have been in there playing piano music over the theatre speakers. But it was locked and dark and nobody was inside. It had taken me much less than a minute to get from one door to the other, and the music had been loud and real. But there was nobody in that whole theatre that day except me. That’s my story. Was it a ghost I heard? Of course not, there is no such thing. Do I enjoy telling it? And as always, I enjoy reading it! Even though you've tweeted this blog post more than once and I was quite intrigued I've only just looked. I think it was because I thought you would tell of a ghost you had seen and I didn't want to disbelieve you. Or something. I keep thinking of a book I read as a child but I haven't a clue what it was. It had a picture of a boy with his (short) hair rising out of his head across the page. I think someone had put a spell on him or something. It wasn't a true story. Or was it? I’m straining here but I can’t remember reading ghost stories as a kid – or as an adult. So most of my fictional ghosts have been televisual or cinematic. I’ve never believed in ghosts either or been interested in challenging those beliefs. On the whole I don’t think I particularly approve of the way Halloween is heading over here – I mean look at the USA – but I’m grateful I don’t live in South America. I’ve just received a book of ghost stories for review. They sent it too late for me to get it done for tonight but it’ll be interesting to see how I feel about the stories. My Mother had a book printed in the 70's with creepy stories, written as if they were all fact. It was too much for me. I was scared just seeing that book. Hope: I remember the stories being so disappointing after the ghostly promise of that cover. Jamie: I think you're right, it's like Mythology and Fables telling us things we need to know about ourselves. Jim: I look forward to your ghost book review.